Then you’re out into the baking sun (sometimes; you are equally as likely to emerge into a dense Stephen King-esque mist) and views expand. and then cling, terrified, to the side of the uppermost rocks as the wind buffets you. That bit is over quickly. The landscape soon owns your attention. The Maiden Stone stands near the foot of the hill, a ninth century Pictish stone displaying a good example of the mysterious, much debated, ‘Pictish beast’. Swimming elephant? Dolphin? Kelpie? A few miles further on is Loanhead of Daviot Stone Circle, the first recumbent circle I ever visited, beautifully cared for by Historic Scotland. Will I stop now? No, one more, then we can put our feet up. 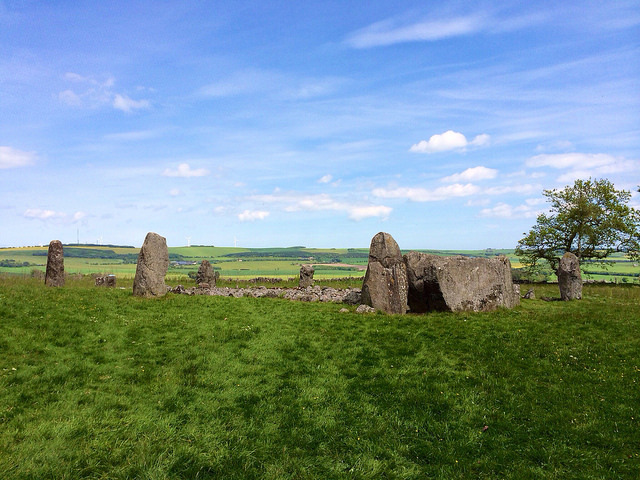 This entry was posted in green places and tagged history, mountain, Scotland, stone circle, summer, trees. Bookmark the permalink. What a beautiful little corner of the world. Thank you for sharing your beautiful photographs. Thanks for the follow on Twitter. This is such a beautiful post, it is so so beautiful, I am so lucky to have found this treasure trove of yours in this little space on web. I would definitely go through all your posts, they seem so promising with so much beauty in words and pictures both..
Unbelievably beautiful. I hope to see it, one day. Lovely photos.